Benny Hinn's Confession On Prosperity Gospel: Why Focus On 2 Sentences? 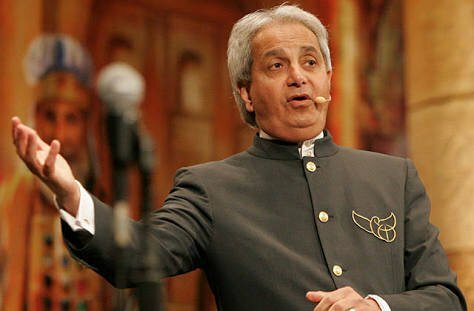 Benny Hinn’s Confession On Prosperity Gospel: Why Focus On 2 Sentences? In the wake of the passing of renowned evangelist Billy Graham, Faith-healing televangelist Benny Hinn, who has often been criticized for his endorsement of the prosperity Gospel, was said to have confessed that he took the prosperity Gospel too far. Benny Hinn did admit that he had taken the prosperity Gospel too far but to focus on one part of the entire discuss that led to this “confession” is to approach the issue with bias. “We get attacked for preaching prosperity, well it’s in the Bible, but I think some have gone to the extreme with it sadly, and it’s not God’s word what is taught and I think I’m as guilty as others. Sometimes you go a little farther than you really need to go and then God brings you back to normality and reality,” Hinn, 65, said as he reflected on Graham’s death with a ministry colleague in a Facebook Live broadcast. Benny Hinn was trying to correct a notion and in doing so, generalized the fact that everyone falls into the error but it was what he said next that puts the premise into perspective. Hinn said as he grew older and came to understand the Bible more, he now realizes that some of the things he learned from preachers when he was growing up aren’t biblical and the popular interpretation of the prosperity Gospel. “The more you know the Bible the more you become biblically based and more balanced in your opinions and your thoughts because we are influenced. When I was younger I was influenced by the preachers who taught whatever they taught. But as I’ve lived longer I’m thinking wait a minute, you know this doesn’t fit totally with the Bible and it doesn’t fit with the reality. So what is prosperity? No lack. I’ve said this before,” Hinn said. “I mean forgive me. People have accused me of things that aren’t even real. One guy wrote a comment ‘Oh he’s worth 40 million.’ Oh how I wish. I would give it all to the Kingdom before God Almighty,” he said. “‘Well he flies private jets,'” he continued mimicking criticism. “No, I don’t. I have not flown private in dear God years. I fly commercial just like anyone else…. “We all sadly make the mistake of thinking that this is what God wants and God says ‘No, that’s not what I want.’ It’s time to live biblically. You know it all comes down to one thing. Do we love Jesus, yes or no? If we love Jesus then it’s all about Jesus. If we don’t love Jesus then it’s about other things,” he said. Look at the quotes without bias nor prejudice, then you will realize Benny Hinn was correcting a notion more than he was confessing. He was trying to take a position of not being ‘holier-than-thou’, therefore he generalized. The world took it out of context and labelled it a confession. This is not to say he is not doing what he is being accused of doing, and neither is this to say he is. But when the man of God does make a real confession, then we can call it what it is but if his intention was to teach the real meaning of prosperity, then why are we only focusing on 2 sentences out of an entire discussion?